This variant of Lilium speciosum is beyond compare. 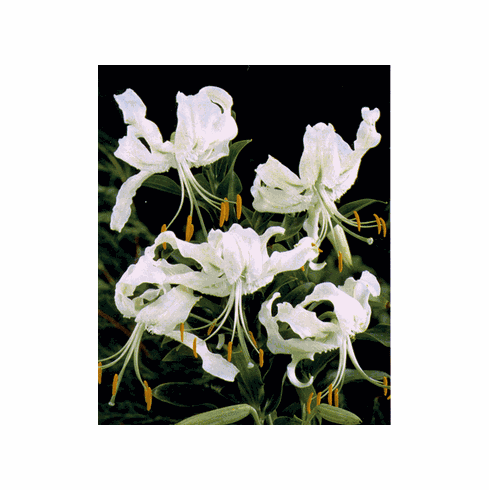 Lightly fragrant, the pure white flowers are truly angelic in color and form. Light green nectary furrows grace the exceptionally beautiful form of these semi-pendant blooms. Flowering in late August in the Northwest, Lilium speciosum album is used by most gardeners to end the blooming season in the garden. Photo inset #1 is a late 50's early 60's vintage photo of F. M. Wilson in a field of his L. speciosum rubrum selection 'Lucy Wilson' near Puyallup, Washington. Photo provided by the late John Schaver, founder of Rex Lilies. Mr. Wilson also made the speciosum selections of 'Cinderella', and 'Grand Commander'. John Shaver once related to us his admiration for Mr. Wilson and the fact he "grew boxcar loads of his rubrums". Photo insert is of seed grown example of var. album courtesy of Martin Toon of the New Zealand Lily Society. Copyright Martin Toon, all rights reserved. Used with permission.